Iconic it its majesty, the splendor of the Eiffel Tower can truly be appreciated as the first rays of daylight hit upon the iron framing, turning the bronze monument a fantastic gold. Views along the Seine are precious and finding the perfect composition was a daunting task as the clouds raced across the sky. 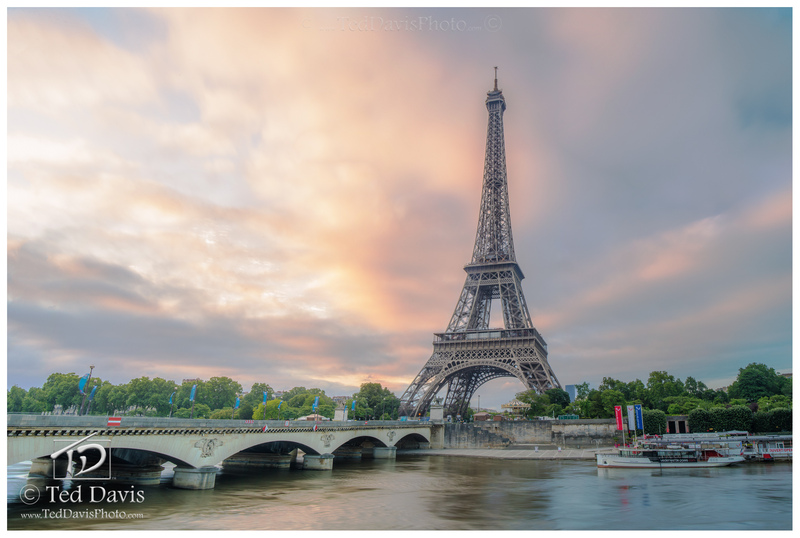 With the sun barely above the horizon, I set up a panoramic long exposure – ensuring I could isolate the Eiffel Tower as the river and clouds moved in unison. Reflecting in the river, the clouds began to take on a brilliant pastel mix of yellow and pink with the slightest hint of orange deep in overlapping cloud layers. Waiting for the colors to deepen, I marveled once again at the Tour Eiffel and hoped I would be able to capture a photograph that did this monument the justice it deserved. Photo © copyright by Ted Davis.